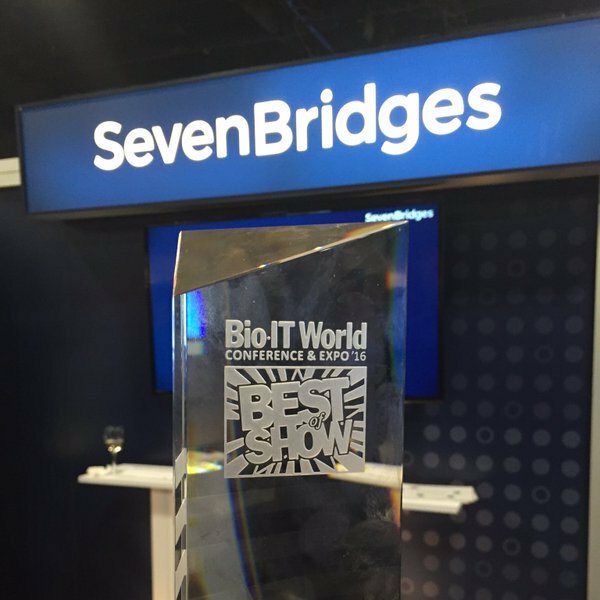 The Seven Bridges Cancer Genomics Cloud (CGC) has won the Best of Show award for Informatics Tools and Data Analytics at the Bio-IT World Conference and Expo, held at Seaport World Trade Center in Boston, MA . This award is judged by a panel of experts from academia and industry; this year’s edition had a record-breaking 46 products in IT and the life sciences. This is our second Best of Show award, with the Seven Bridges Platform winning the Infomatics Data and Tools division in 2013. The CGC hosts several petabytes of TCGA data, hosts hundreds of bioinformatic tools, and gives researchers instant access to thousands of CPU cores for analysis. It allows researchers to quickly and intuitively analyze and visualize TCGA data. The CGC is now open for researchers to use, and more than $1,000,000 in funding is available to support computation and data storage on the system. Sign up to use the CGC, or check out our introductory webinar. In the days before the conference, we hosted a hackathon in which participants used the CGC to develop projects using TCGA data. In just a weekend teams wrapped up projects using this data, instead of spending weeks trying to download and store it. We’d like to congratulate everyone on the CGC team, our partners at the NCI and all contributors to The Cancer Genome Atlas (TCGA) for helping to make this possible.